Dynamics are a crucial part of playing music. When controlled they bring music to life, but uneven or wild playing can ruin a performance. 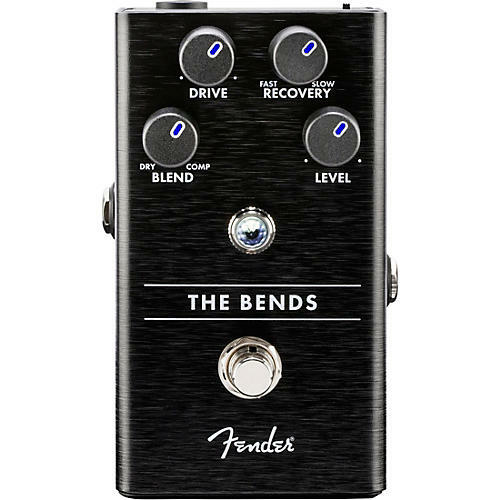 Fender put its expertise to work creating The Bends Compressor, a studio-quality stompbox that tames wild volume spikes without altering your tone. Drive and Recovery controls let you dial in the perfect amount of compression to complement your playing style and extend sustain, while the Blend control lets you mix in the dry signal to maintain your natural pick attack. The Amp Jewel LED changes color from white to pink along with your playing to help show when the compression circuit is engaged and how long your signal is affected. Designed by Fender in-house team of experts, The Bends Compressor is an all-original circuit. Fender consulted with a plethora of players while designing this pedal, and the resulting stompbox is packed with stage-ready features. The chassis is crafted from lightweight, durable anodized aluminum, and the Amp Jewel LED gives your pedalboard the classic Fender look. The LED-backlit knobs show your control settings on a dark stage at a glance. The designers even made swapping batteries quicker and easier with their exclusive “patent applied for," magnetically latched 9V battery door.